The high power pull and the upright row are two techniques in weight lifting that work various muscles throughout the body. Although both moves are similar, the upright row targets a specific muscle whereas the high power pull works many muscles throughout the legs, shoulders and arms. Consult your physician before you begin a new exercise program to make sure that you're healthy enough for weight lifting. The high power pull is a technique that utilizes a barbell. Begin in a standing position with your feet under the bar. Your feet should be slightly wider than shoulder-width. Squat down over the bar so that your shoulders are directly over the bar and your back is arched. Grip the bar with straight arms. Straighten your legs and pull the bar up off the floor. Raise your shoulder and extend the body until you're on the balls of your feet. Pull the bar to your neck. Lower the bar slowly and bend your knees on the return. The high power pull involves your entire body and works many muscles. The movement extends the muscles in your hips, knees and spine. The high power pull works the plantar flexion in your ankles and the flexion in your elbows. Though the high pull works primarily your upper body, because you're squatting, the muscles in your legs will also benefit. The high power pull strengthens the trapezius muscles as well as the hip adductor muscles, gluteal muscles, hamstrings, quadriceps and shoulders. The upright row is similar to the high power pull but is considered a basic weight lifting move as opposed to a power move such as the high pull. Hold the barbell with your hands shoulder-width apart or slightly closer. You should be holding the bar with an overhand grip with the barbell at your waist. Bend your elbows and pull the bar up to your neck. Slowly lower down. This pull works your upper body, primarily targeting your lateral deltoid. Both of these techniques have possible variations. The movement is generally the same and each variation will work the same muscles. You can also perform the upright row with two dumbbells instead of a barbell or just one dumbbell to work each side separately. The high pull is usually done with barbell, but you can use a kettlebell if you prefer. 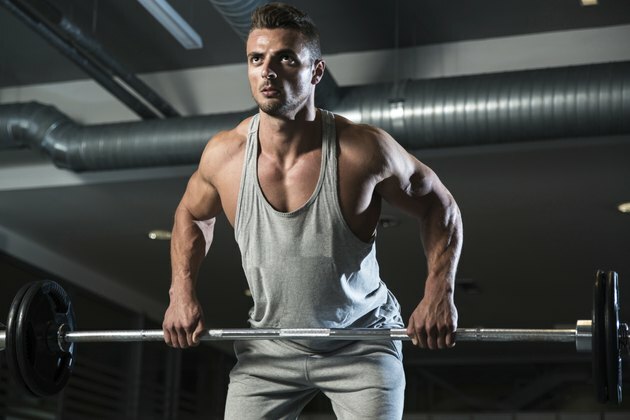 Make sure you have a spotter or a trainer before you try these weight lifting techniques. Incorrect form or using too much weight can lead to serious injury. What Is a CrossFit Push Jerk?